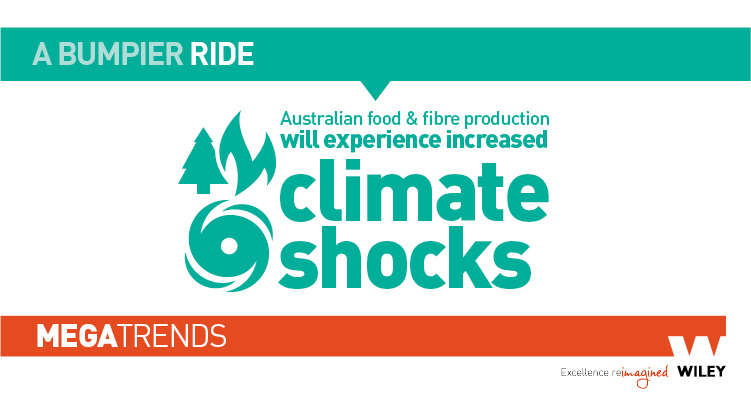 The final part in our CSIRO Megatrends series focuses on the impact of extreme environmental and economic systems on the Argrifood sector. The unique challenges and opportunities presented by the fifth megatrend are summarised below. In the coming years the world will potentially experience more risks associated with changes in the global climate and economic and environmental systems, due to the increasing interconnectedness of the global economy. In Australia in particular, extreme weather and fire events are set to increase while average rainfall is set to decline in the coming years. 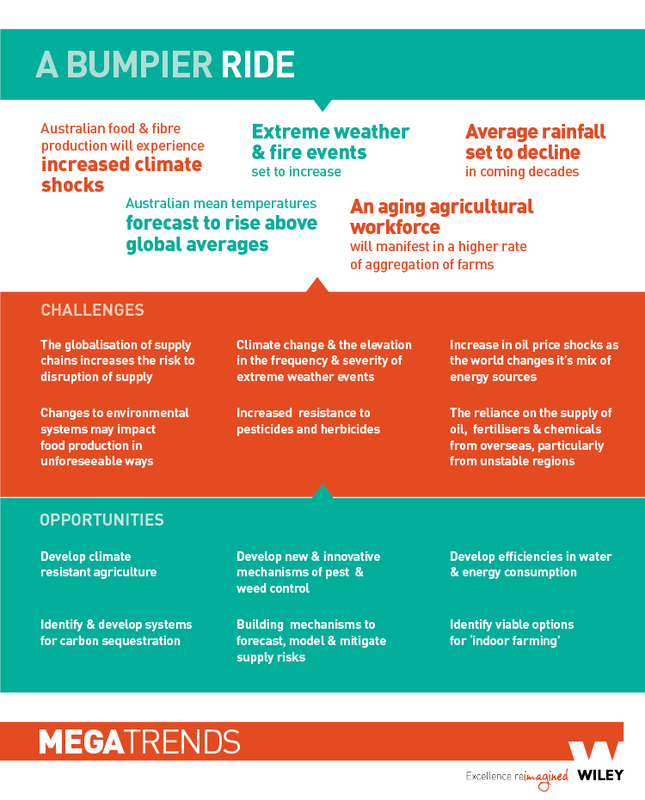 Australia’s mean temperature is also predicted to rise above global averages leading to the likelihood of the Australian Agribusiness industry experiencing an increased number of climate shocks. The globalisation of supply chains and the growing interdependency of world economies also increases the risk of disruption of supply. The impact of climate change on environmental systems is yet to be fully realised. Changes in weather patterns and the world environment may impact food production in yet unforeseeable ways. Furthermore, over the coming years the world will change its mix of energy sources as we move away from more traditional methods to new technologies. The resulting changes in supply and demand within the energy sector are likely to increase the potential for world oil price shocks. The “bumpier ride” megatrend highlights significant opportunities to address the increased risks associated with changes in the global climate and economic and environmental systems. New business models will arise to address the need to develop new technologies to mitigate these risks. Crops that are resistant to climate change as well as the development of viable methods for ‘indoor farming’ will emerge. New mechanisms will be developed to better forecast, model and mitigate supply risks and potential climate shocks. Another significant market to emerge from this megatrend is the development of efficiencies in water and energy consumption as well as innovative techniques for non-traditional land use.